In the ratings for safes, there is no such thing as a “fire proof safe”, only Fire Resistant Safes. Safes are normally categorised in hourly ratings such as 1/2hour, 1 hour and 2 hour. This safe is 1/2 an hour. Please note: Depth measurement does not include the handle or keypad . Please allow 50mm. Please note: Depth measurement does not include the handle or keypad. Please allow 50mm. Please note: Depth measurement does not include the handle, keypad or hinges. Please allow 75mm. -KCR4; this safe is Jewellery Standard safe. This is the Taj Mahal of security for valuables. Constructed to the Australian health and pharmaceutical specifications. 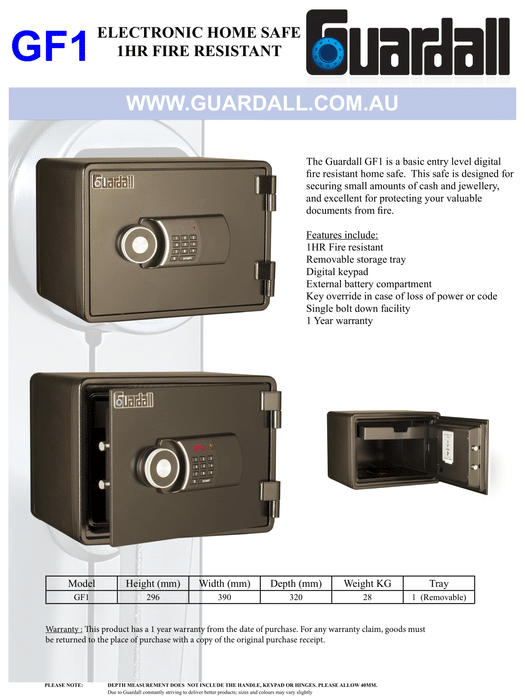 -BFG400; This is one of our most popular home safes; great size, superior security and can have felt lined drawers inserted into the safe for organisation of your valuables. What Does Cash Rating Mean? Here at Toowoomba Locksmiths we are a small team of dedicated security professionals and we aim for high service and quality products every time. With diverse experience within the Locksmith and Safe industry, we are confident that with Toowoomba Locksmiths, you are in safe hands.